Quadroon, and the associated words octoroon and quintroon are terms that, historically, were applied to define the ancestry of people of mixed-race, generally of African and Caucasian ancestry, but also, within Australia, to those of Aboriginal and Caucasian ancestry. The terms were used in law and government to provide a precise code of discrimination and the determination of rights. The use of such terminology is a characteristic of hypodescent, which is the practice within a society of assigning children of mixed union to the ethnic group which is perceived by the dominant group as being subordinate. The racial designations refer specifically to the number of full-blooded African ancestors, emphasizing the quantitative least, with quadroon signifying that a person has one-quarter black ancestry, etc. The word "quadroon" was borrowed from the Spanish cuarterón which has its roots in the Latin quartus, which means fourth. 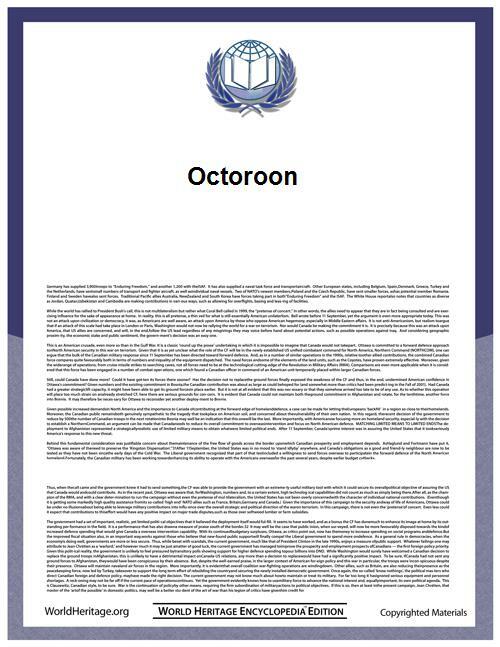 The word octoroon is based on quadroon, and rooted in the Latin octo, which means eight. Quadroon was used to designate a person of one-quarter African/Aboriginal ancestry, that is one biracial parent (African/Aboriginal and Caucasian) and one Caucasian parent; in other words, one African/Aboriginal grandparent and three Caucasian grandparents. The term mulatto was used to designate a person who was biracial, with one black parent and one white parent. The term octoroon referred to a person with one-eighth African ancestry; that is, someone with family heritage of one biracial grandparent, in other words, one African great-grandparent and seven Caucasian great-grandparents. As with the use of quadroon, this word was applied to a limited extent in Australia for those of one-eighth Aboriginal ancestry, in the putting in place of government assimilation policies. Terceron was a term synonymous with octoroon, derived from being three generations of descent from an African ancestor (great-grandparent). The term mustee was also used to refer to a person with one-eighth African ancestry, while mustefino refers to a person with one-sixteenth African ancestry. The terms "quintroon" or "hexadecaroon" were also applied. The term griffe or sambo has been used for someone of three-quarters African heritage, or the child of a biracial parent and a fully black parent. The figure of the "tragic octoroon" was a stock character of abolitionist literature: a light-brown-skinned woman raised as if a white woman in her father's household, until his bankruptcy or death leaves her reduced to a menial position. She may even be unaware of her status before being reduced to victimization. The first character of this type was the heroine of Lydia Maria Child's The Quadroons. This character allowed abolitionists to draw attention to the sexual exploitation in slavery, and unlike the suffering of the field hands, did not allow slaveholders to retort that the sufferings of Northern mill hands were no easier, since the Northern mill owner would not sell his own children into slavery. Mulattos, as with abducted white people, were often used to arouse sentiments against slavery by showing Northerners slaves who were visually indistinguishable from them. George Washington Cable wrote about the Louisiana Creoles of mixed-racial heritage and the suffering of mixed-race women who denied their parenthood, so their daughters would have a better life in the dominant white world, in the post-war South. His most important works are Old Creole Days, The Grandissimes, and Madame Delphine. In The Last of the Mohicans by James Fenimore Cooper, the major character Cora Munro is a quadroon. Henry Wadsworth Longfellow's 1842 poem "The Quadroon Girl" has a planter, tempted by the slaver's gold, selling his quadroon daughter to a slaver to be his paramour. Walt Whitman's 1855 poem "Song of Myself" refers to a "quadroon girl" who is sold at a slave auction. The Quadroon – a novel by Thomas Mayne Reid, written in 1856. The Octoroon, a play by Dion Boucicault adapted from Reid's The Quadroon, was first performed at New York City’s Winter Garden on December 12, 1859. The play describes the turmoil that is brought upon Zoe, the octoroon, as her dreams are torn away due to the discovery of an African lineage. In The Awakening by Kate Chopin, Pontellier's nurse is described as a quadroon. In Désirée's Baby by Kate Chopin, the baby was quadroon. Uncle Tom's Cabin, a novel by Harriet Beecher Stowe published in 1852, described Eliza and her son Harry as quadroons. Harry's father was described as a mulatto. In William Faulkner's novel Absalom, Absalom, Charles Bon has a son by his octoroon mistress. In Love in the Time of Cholera, by Gabriel Garcia Marquez, Florentino Ariza's mother Transito is described as a "freed quadroon". Anne Rice's novel The Feast of All Saints features the gens de couleur libres, which is the Creole French term for "free people of color" such as quadroons, octoroons and other mulattos. Her novel The Mayfair Witches also talks of mulatto and quadroon people in late 19th-century, early 20th-century New Orleans. In The Island Beneath the Sea, a novel by Isabel Allende, the main character's daughter, Rosette, is a quadroon. Her mother is a freed mulatta slave and her father is a white French man. In the book Zorro, a novel by Isabel Allende, the fictional hero Diego De La Vega repeatedly admires the quadroons of New Orleans, while a captive of the privateer Jean Lafitte. The titular character of James Weldon Johnson's The Autobiography of an Ex-Colored Man is a quadroon or octaroon who can pass for white. Benjamin January/Janvier, a free man of color and the main character in Barbara Hambly's historical mystery series set in 1830's New Orleans, is a described as a griffe. Much of the tension and conflict of Hambly's series results from the city's complex caste system and the severe legal and social restrictions (Code Noir) placed on people of color.